The Microsoft Office Clipboard allows you to copy up to 24 multiple text and graphical items from Office documents or other programs and paste them into another Office document. 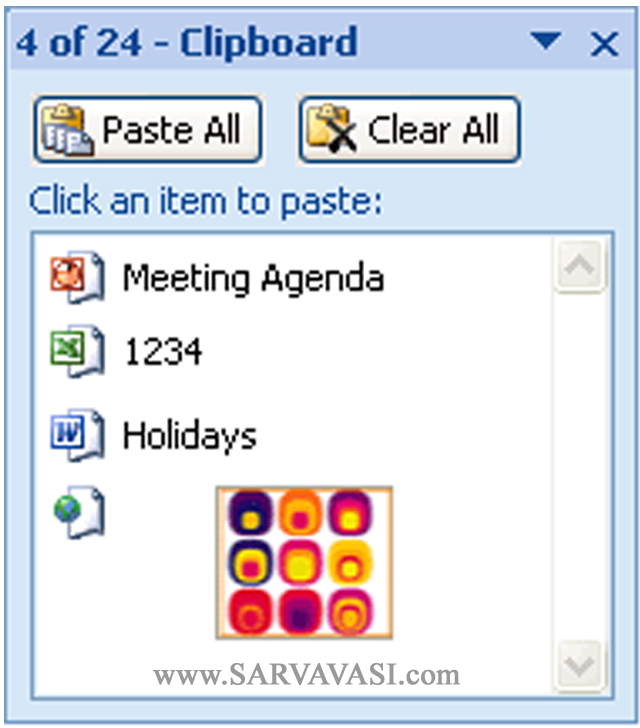 The Office Clipboard works with the standard Copy and Paste commands. Just copy an item to the Office Clipboard to add it to your collection, and then paste it from the Office Clipboard into any Office document at any time. 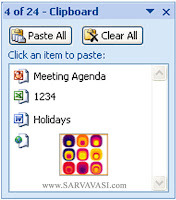 Up to 24 collected items stay on the Office Clipboard until you exit all Office programs or you delete the items from the Clipboard task pane. After you exit all Office programs, only the last item that you copied stays on the Office Clipboard. When you exit all Office programs and restart your computer, the Office Clipboard is cleared of all items. 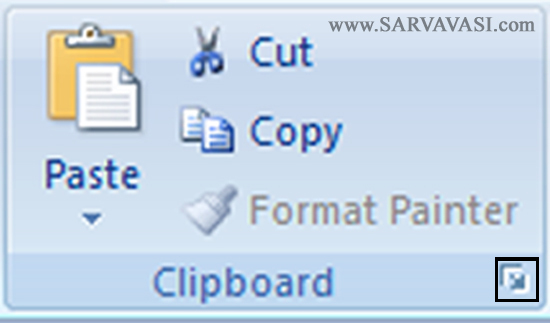 The Office Clipboard is related to the system Clipboard in Microsoft Windows in the following ways. When you copy multiple items to the Office Clipboard, the last item that you copy is always copied to the system Clipboard. When you clear the Office Clipboard, the system Clipboard is also cleared. When you use the Paste command, the Paste button, or the keyboard shortcut CTRL+V, you paste the contents of the system Clipboard, not the Office Clipboard. 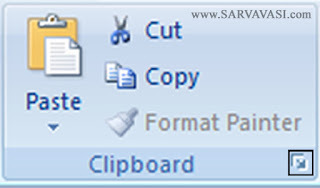 Copy (Ctrl + C):This option is used to copy the selected information.